Double the chocolate, double the fun! 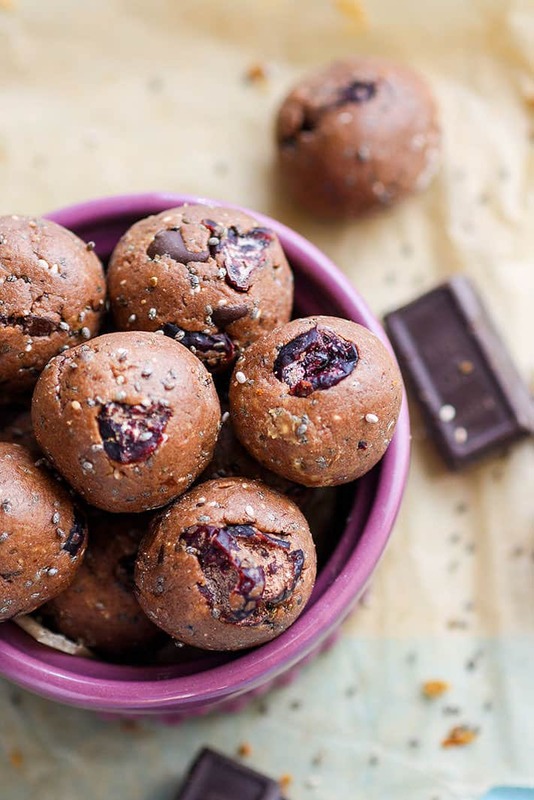 Double Chocolate Cherry Chia bites with Chocolate Chips are a healthy way to satisfy your sweet tooth while getting an extra boost of omegas and fiber. 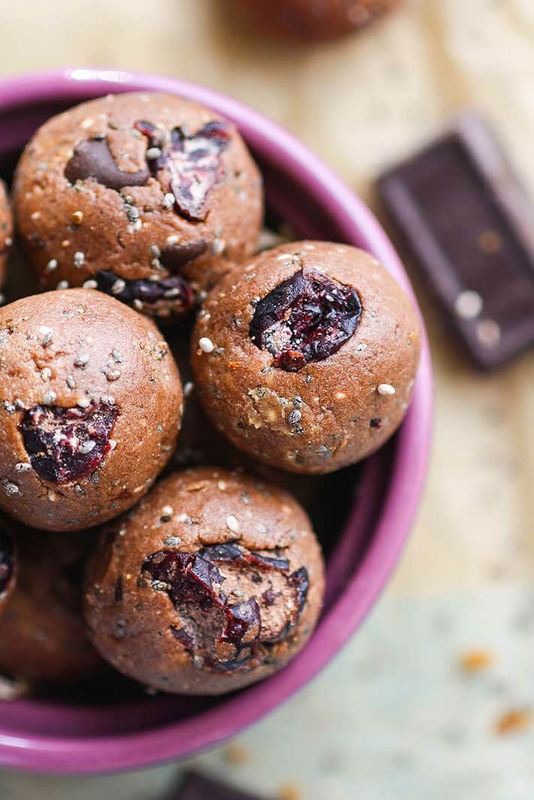 These bites are grain free, easy to make, vegan friendly, protein packed, and the perfect balance of chocolate with dried tart cherries. Well, I’m down for another update. Geeze I have a lot of old healthy bite recipe to revamp or retake pictures. But can I be honest? I’m kinda liking this. It makes me think more creatively, plus I can eat the extra or sell them to my gym clients. That’s a win, win right? Anyway, a few years back I wrote a post on 3 ways to use chia! If you want, you can read it and see the old recipe here (warning, it’s old school). Haha. But the recipe I had used a gluten free cereal and another “fudge” like flavor in the chocolate cherry bites. Today I decided to take it up a notch. 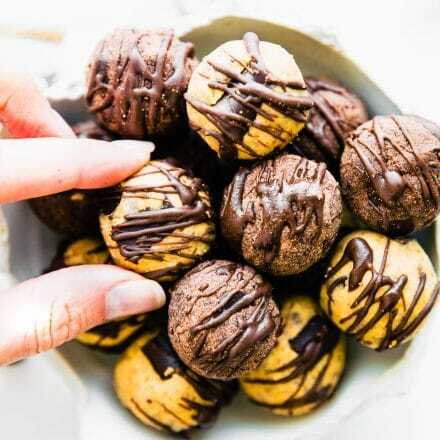 I’m adding and subtracting ingredients to these chocolate cherry bites. In fact, I even used black chia seed. Whoa… so matchy match! But the main reason I am keeping both is so that you can choose your texture and macronutrient intake. Obviously the bites posted in the old recipe are more crunchy and have a little more sugar and carbohydrate per bite. So they would be great for post workout/recovery fuel. 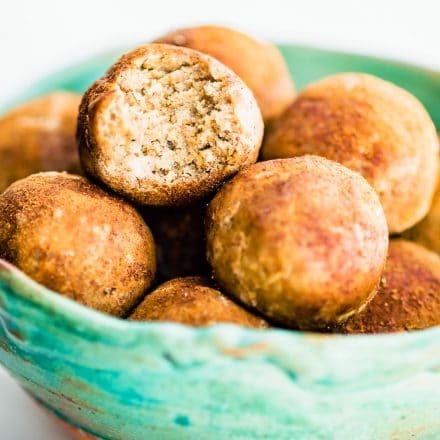 These bites are grain free and great for pre or post workout. 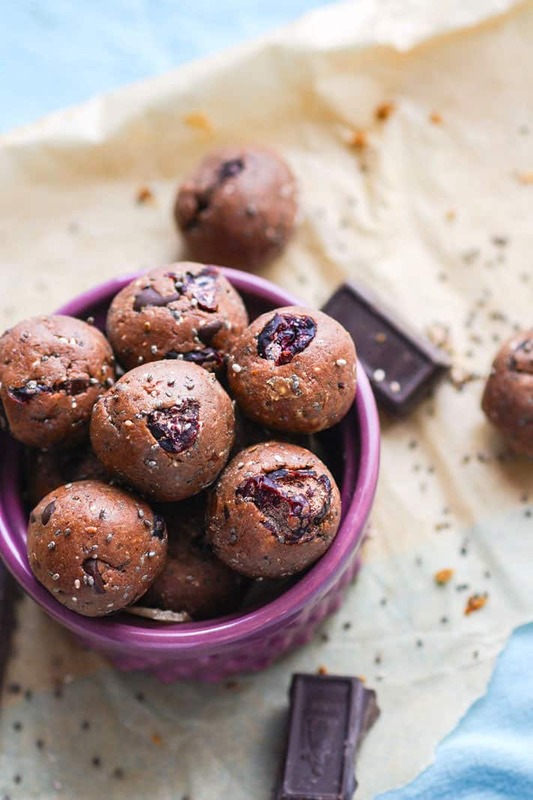 Naturally sweetened and with a bit more healthy fats added… oh and DARK CHOCOLATE. So here ya go, let me know if you try the new ones! This recipe is super easy because you don’t need to grind anything! just mix up dry ingredients first, then add in nut butter, extract, and honey. Mix well, then roll into balls/bites. Freeze right away then store in fridge or freezer to maintain freshness. Makes around 28 bites, give or take. NOTE –>if batter is too dry, add more pb/honey. If it’s too wet, add in coconut flour or protein powder. If you don’t want to use chocolate protein, you can use a chocolate peanut flour. 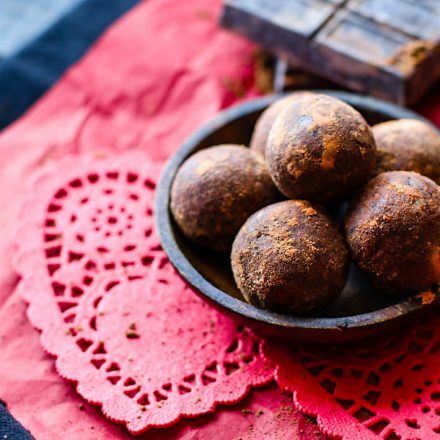 You can use another flour but it might not be as chocolatey in taste. Now, enjoy the weekend and good luck to all those running, racing, training out there. It’s going to be a great weekend for it. 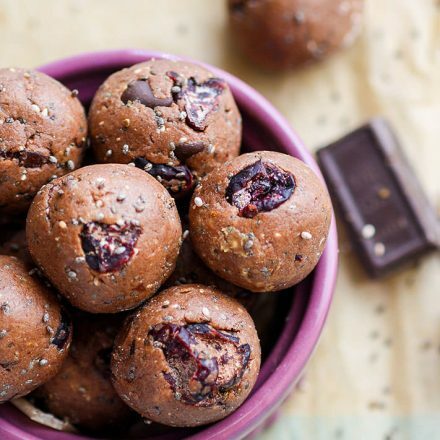 chocolate + cherry = double antioxidants. Would you agree? p.s. stay tuned for next Friday. 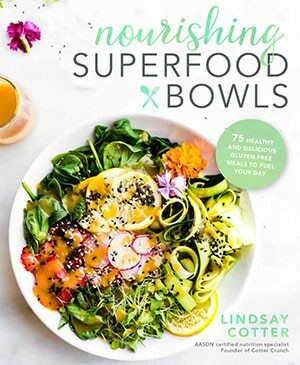 A giveaway for October healthy bites! haha me too! like a box of chocolates. p.s. these would be great for post 20 mile runs. How did it go? totally! fiber and omegas = WINNING! always. 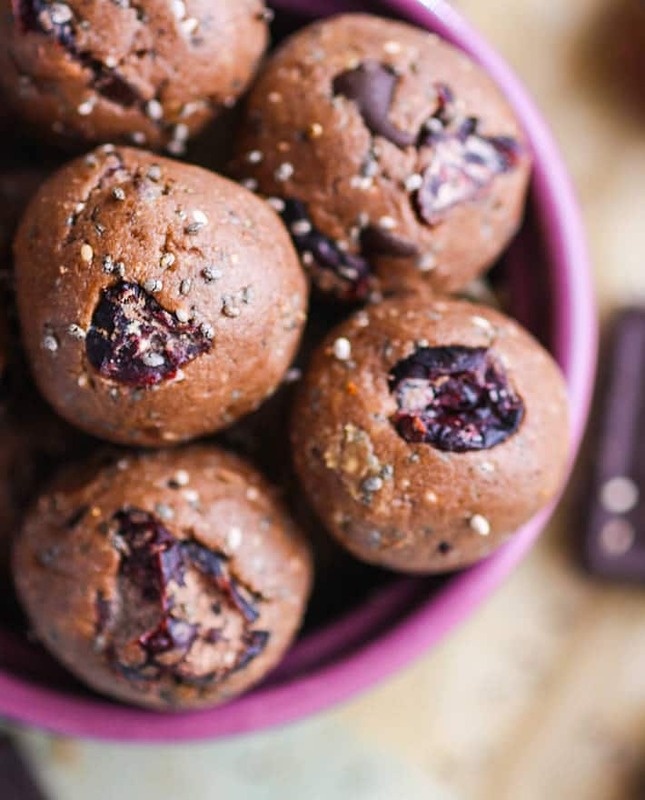 I am always looking for ways to incorporate more chia seeds into my diet, and these look too good to pass up! PS: I am so with you on the pleasure of updating old recipes to be prettier, easier and more delicious. It’s so satisfying to realize how far you’ve come as a recipe developer! Oh yes. Antioxidants are definitely the first thing I think about when I see these bites. It’s not like I’m thinking… o.m.g freaking DELICIOUS 😛 Hope you’re having a great weekend, lovely lady! these are so for you! Haha, I have to share these with my blogger bestie! We have been obsessed with chia seeds lately! OBSESSED! who’s your blogger bestie? Let’s start a chia club! I think this recipe already had me at the “double chocolate”. I like how you used chia seeds for extra omega-3 and fibre. I think I’m going to try making this with some nuts added as well. haha double anything is always fun, right? They look so so good!! I love that they’re food processor free, since I’m currently traveling through Asia and my kitchen resources are very limited. let me know if you do Teffy! 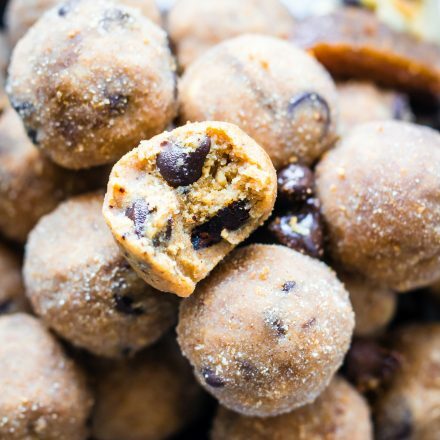 I’ve started to use coconut flour for snacks and baking – I like it! haha never too late! just on board the chia train! p.s did you hear from sizzlefish yet? I think they could help me wean off my crazy sugar habit lately! I gotta make these this week. Wish I could send them!! So good. Chocolate and cherry is one o fmy all time favorite flavor combos. Always has been. And you know the drill: chocolate is a bean, beans are plants, plants make salad, and if you add the cherries, this is the healthiest salad like ever.! Ummmm these look insane. They remind me of my cacao cherry protein shake, which is delicious. CAN WE TALK ABOUT THAT MAGENTA PURPLE RAMKIN THOUGH!? Is that what that is? Because I need it in my life. haha yes! i actually got it at easter time at safeway! Can’t believe these were one of the first bites I tried!!!! Gah… if only you had a healthy bite assistant! I need some bites asap! YUM!!! 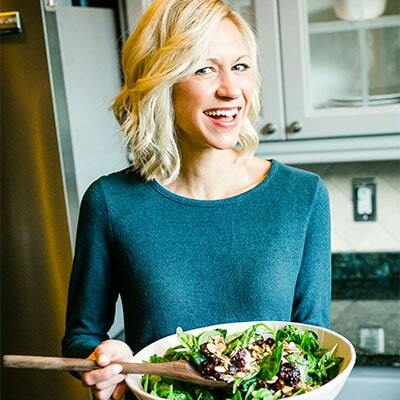 I love this recipe, one of my faves and the switch ups…mmm x1000!